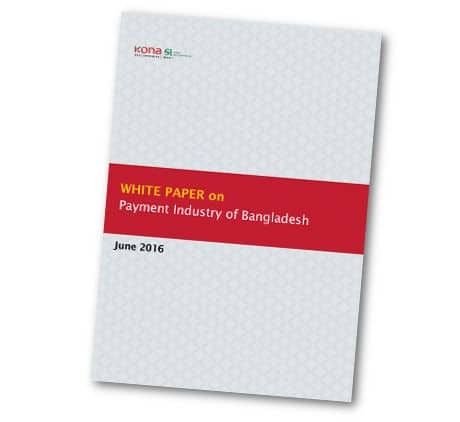 A 29-page white paper that explores the payment industry of Bangladesh and includes a detailed examination of its current systems, the evolution of alternative payment methods and the uptake of NFC, tokenization and EMV is now available to download from the NFC World+ Knowledge Centre. ‘Payment Industry of Bangladesh’, published by South Korean smart card provider Kona, looks at the background of the country’s payment industry, the current payment scenario in Bangladesh and the evolution of payment instruments such as cash, debit and credit cards, money transfers and mobile financial services. It goes on to explore the deployment of technologies including NFC, host card emulation (HCE), tokenization, mobile payments and EMV. The white paper also identifies some of the key players operating within the country and sets out some of the future trends for the country’s payments industry. “While globally, many financial institutions are trying to introduce wireless payment via contactless EMV cards or using NFC-based smartphones, Bangladesh is still lacking behind in several aspects,” Kona says. “One of the key setbacks is lack of NFC-enabled handsets and also NFC-enabled POS hardware’s unavailability. Readers can download this white paper free of charge here.